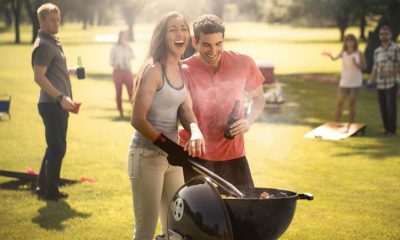 6 Best Gas Grills 2019 - Don't Buy the "Gas Grills" Before You Read This Review! Gas grills are a modern alternative to classic charcoal grills. These grills feature a flat surface–where you place the food you want to cook–and gas-fueled flames underneath, which heat your food from below. There are many benefits of grilling over gas as opposed to using another type of grill. It takes very little time for a gas grill to heat up to your desired temperature, so you can prep a delicious meal for your family without having to carve a large chunk of precious time out of your evening. Gas grills also make it easy to heat your food to the right temperature without burning it. They’re also less of a mess, as they don’t produce nearly as much smoke as charcoal grills. Plus, cleaning a gas grill also tends to be easier than cleaning other types of grills, as you don’t have to deal with disposing of any charcoal or ash when you’re done cooking. Although there are still plenty of charcoal purist grillers out there–and they have their own reasons behind their grilling choices–many modern grill enthusiasts consider gas grills to be a more convenient, faster, less expensive way to grill food from the comfort of your own backyard. 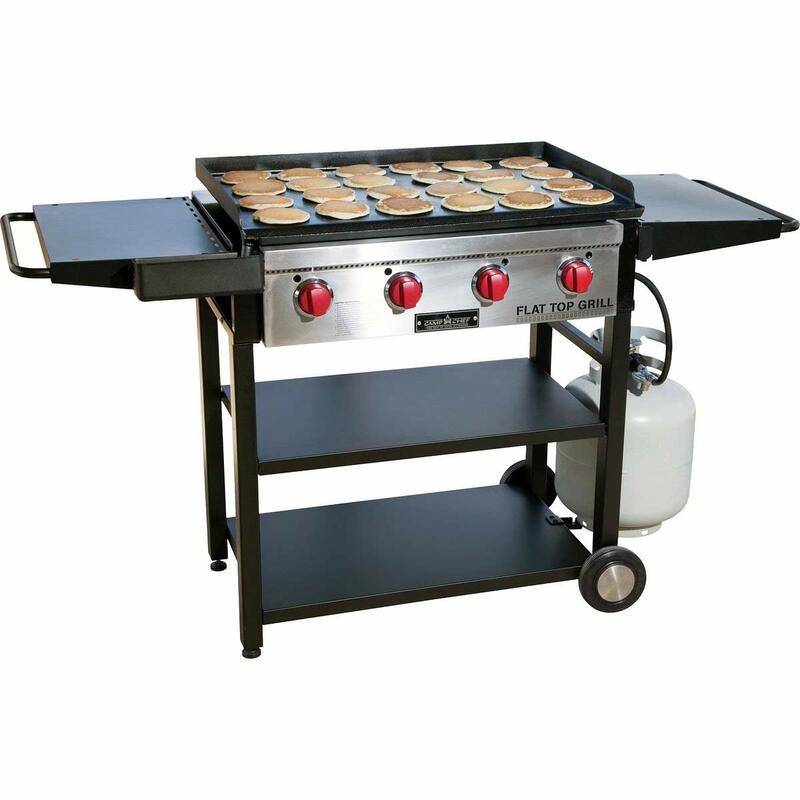 You can cook anything and everything–from eggs and pancakes to steak and potatoes–on this versatile flat top gas grill. Its four burners are independently controlled, so you can cook different types of foods at different levels of heat at the same time. Starting this grill is effortless. 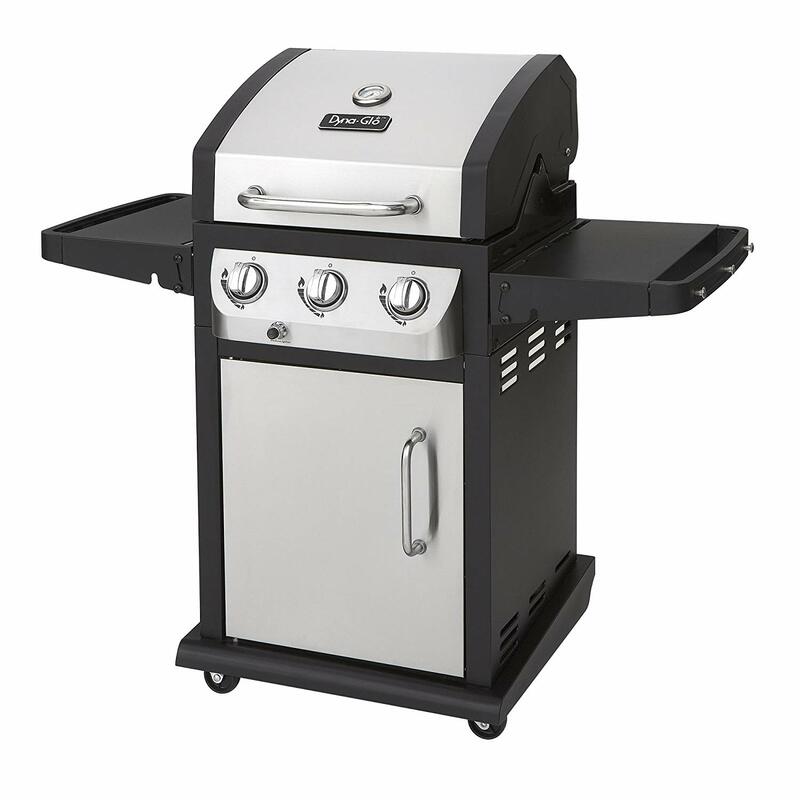 Just press its built-in push button ignition to ignite the grill’s 20-pound propane tank and start cooking. 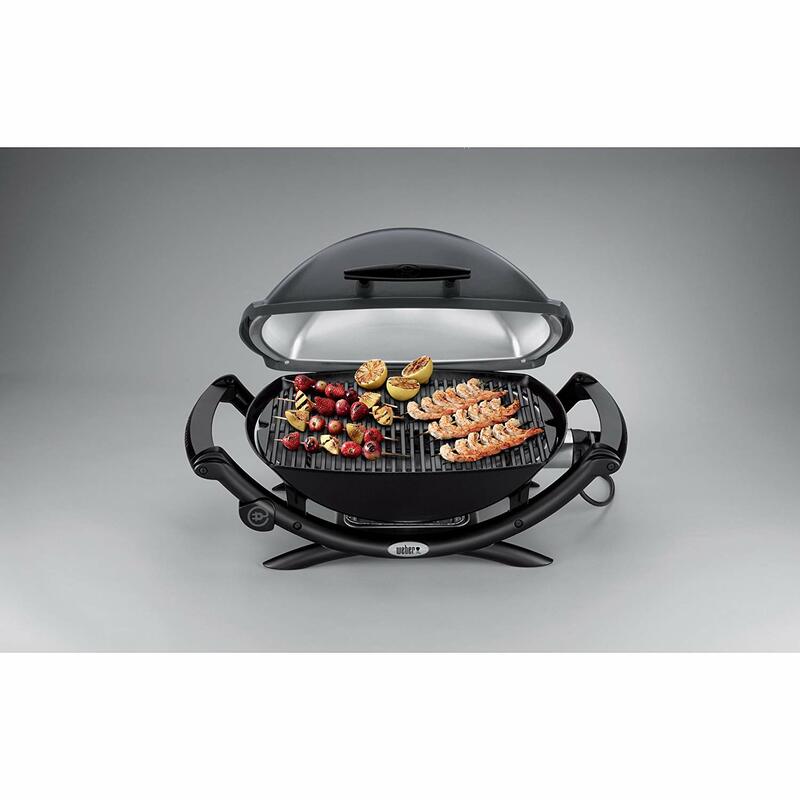 Crafted from a powder-coated black steel with stainless steel burners and a rolled steel cooktop, this grill is sleek and ultra-durable. Its smooth surfaces are easy to clean, and the grill itself is easy to transport and store with its fold-up legs and four attached wheels. Its bottom shelf and two side shelves give you room to prep your food before you cook it as well as safely store your spices and grilling accessories when you’re done. 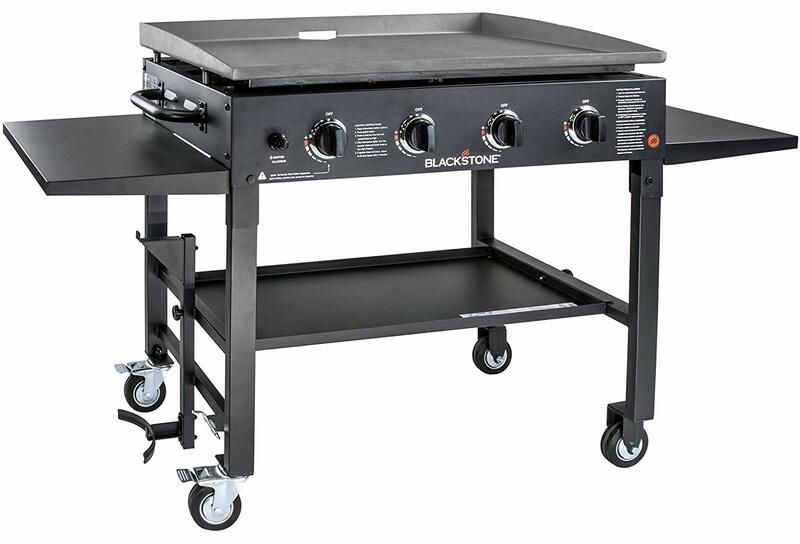 This high-performance gas grill features a 646-square inch grilling area that is made from durable cast iron cooking grates and cook food for eight to ten people at a time. Its four stainless steel burners are tapered burner tubes that provide a continuous heat flow to cook your food evenly every time you turn on your grill. Their porcelain-enameled Flavorizer bars ensures more tender meat infused with more intense flavors every time. Start cooking effortlessly by turning the grill’s Infinity Ignition knob to instantly ignite the gas and start the burners. Monitor your food while it cooks using the included iGrill3 Bluetooth thermometer that displays real-time stats on your grill’s temperature and fuel levels at any given time. Prep and cook in the same space with this grill’s two built-in stainless steel workspaces, where you can prepare your food before setting it on the grill. Plus, you can keep all your grilling essentials easily within reach with its built-in hanging storage hooks. 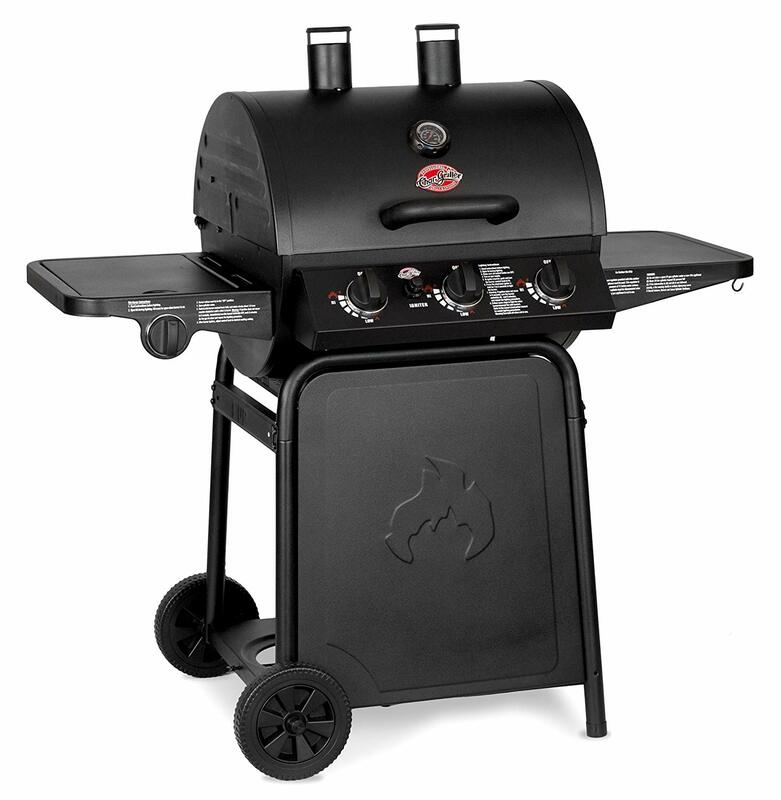 As an added bonus, the grill is available in four different colors–black, copper, gray, and red–for added style and fun. The grilling area of this gas grill–which provides 390 square inches of primary grilling space and 117 square inches of secondary space for a grand total 507-square inch grilling area–is made from durable cast iron cooking grates enameled with porcelain. These heavy-gauge grates expertly retain heat and evenly sear your food without allowing any flavorful juice to escape. Start cooking with one touch by pushing the grill’s Electro-Pulse ignition button for immediate ignition and burner start-up. Three straight stainless steel burners provide continuous heat for your food until it is cooked evenly all the way through. Steel heat tents help lock in more intense flavors. A double-wall stainless steel lid keeps heat inside the grill while you cook. You can monitor this heat at all times with the built-in temperature gauge. Keep your essential grilling accessories right by your side at all times with this grill’s built-in side shelves, towel bar, and tool hooks. These side shelves are collapsible to make this compact grill even more portable and easier to store. This 2-in-1 grill and griddle allows you to cook anything you want from the comfort and convenience of your own backyard using just one appliance. It features expansive grilling and griddle surfaces, with a griddle area measuring 604 square inches and a grilling area measuring 501 square inches. Using this grill is quick and easy right from the get-go. It comes pre-seasoned, so you can start cooking on it right away without worrying about prepping it yourself. Its four high-performance stainless steel burners are easy to start and ignite instantly with their matchless ignition start-up. Prep your food effortlessly with built-in side shelves and clean up just as easily with the grill’s grease tray and catch bucket. 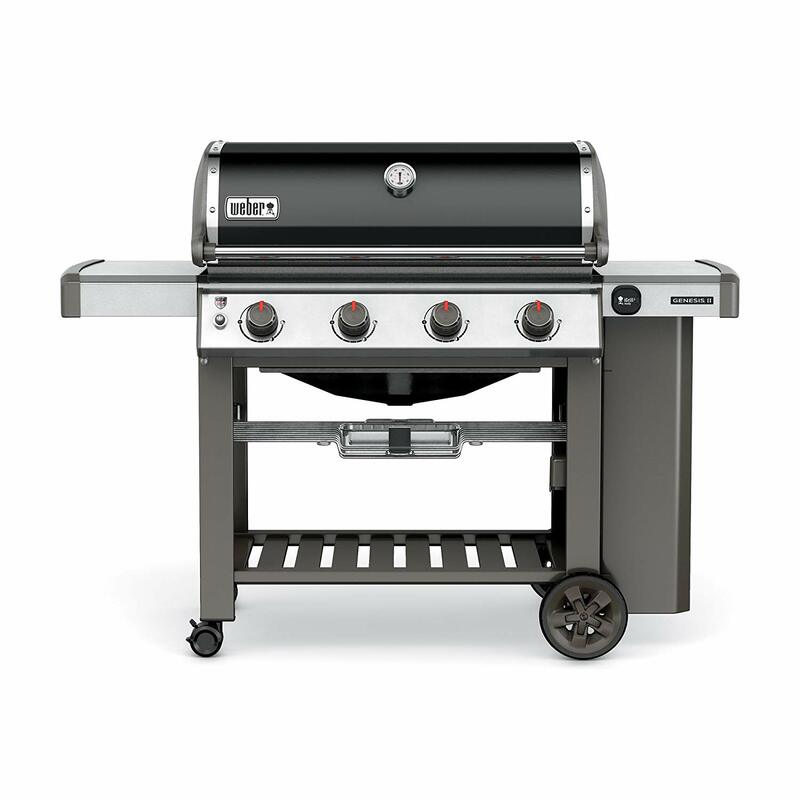 The cast iron cooking grates of this gas grill are coated with porcelain for maximum durability and performance. These grates offers 438 square inches of grilling space. Start cooking instantly with the electronic starter that instantly ignites the grill’s even-heating stainless steel burners. When you’re done grilling your food, transfer it to the grill’s expansive, 192-square inch warming rack to keep it warm until you’re ready to serve it. Move and store this grill easily; its frame weighs less than 100 pounds and it includes attached wheels for added portability. You don’t have to worry about cluttering up your yard with various cooking appliances. Just use this 8-in-1 high-performance grill and smoker combo instead for all your outdoor cooking needs. 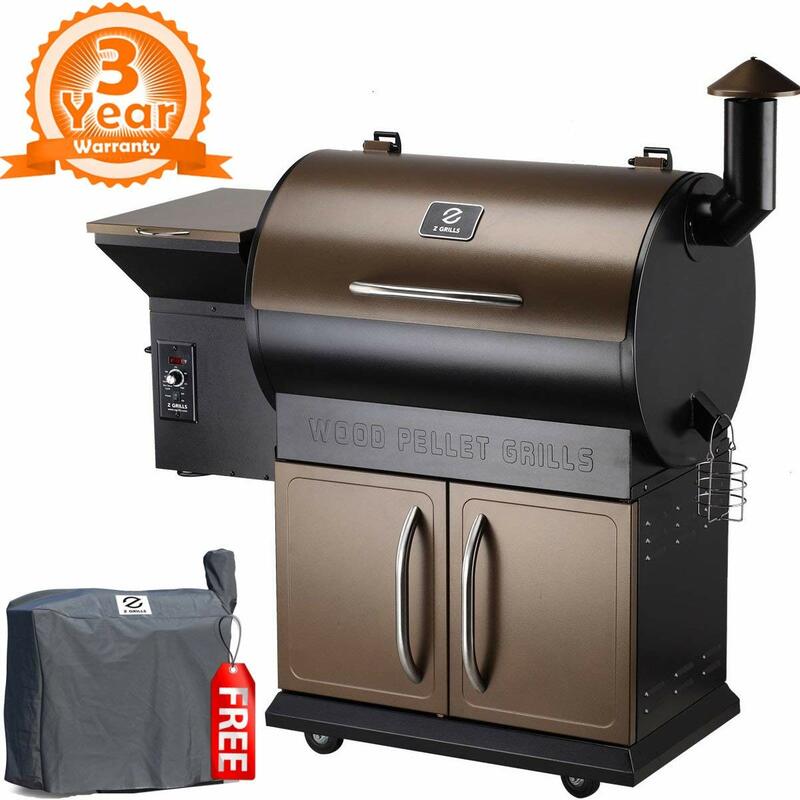 This amazingly versatile wood fire pellet grill allows you to grill, roast, braise, barbecue, char-grill, bake, or sear, depending on your preferences and the food you want to make. Control the temperature of this grill effortlessly with its built-in digital control board that auto-ignites and allows you to set the temperature between 180 and 475 degrees Fahrenheit. After you set the temperature, monitor it at any given time during your cooking process by checking the clear, easy-to-read LED temperature readout. This grill is perfect for beginners who haven’t yet mastered grilling, but performs well enough for seasoned grillers to enjoy it too. It doesn’t matter if you’re a seasoned outdoor cooker or a newbie in the world of grilling. If you’re looking for a fast, easy, convenient way to cook your food outside, check out the six top-quality gas grills in this post.